There is a lot of places worth seeing in Moscow apart from football matches: the hardest thing is finding time for everything. As the opening day of 2018 FIFA World Cup Russia™ approaches, it’s important to have a to-do list for the cities hosting the championships. Today, we start with Russia’s capital, which always has had much to offer guests, and 2018 is no exception. The main destinations for those visiting Moscow during the World Cup are quite obvious – Luzhniki Stadium and Otkrytiye Arena – both of which will host the matches. 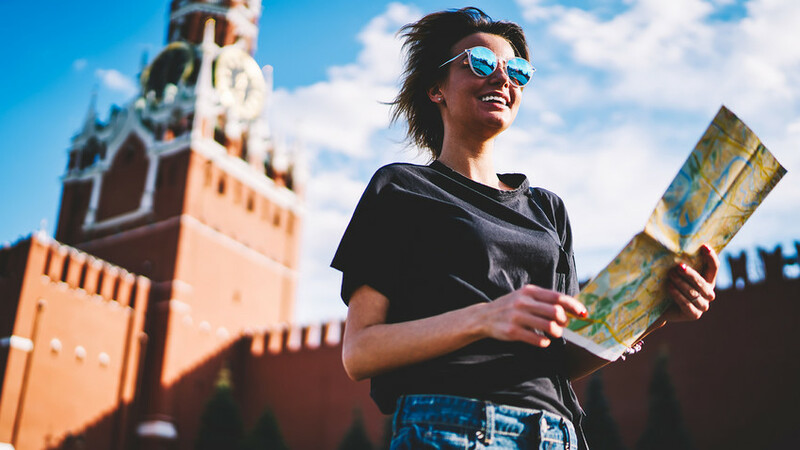 But supposing that many people won’t hesitate to explore the glorious capital apart from the hotel-stadium-hotel route, we would like to point out that there are many interesting things you can do in Moscow. Here we go. Not long ago a street crowded with cars, now Tverskaya is green, with wider sidewalks - an ideal place for rambling and enjoying the spirit of city's center. In recent years, Moscow has changed beyond recognition. 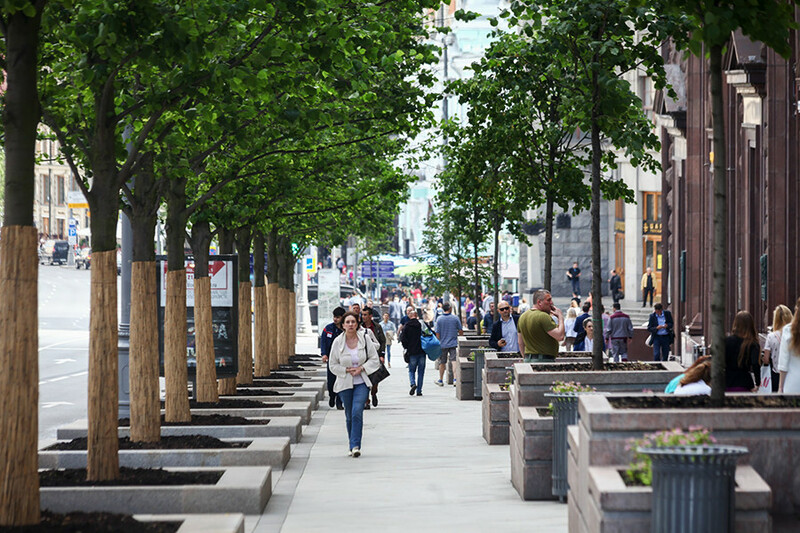 There are more pedestrian-friendly areas; central streets, such as Tverskaya and Novy Arbat, have wider sidewalks and are far more comfortable for walking. Today, Moscow, from the Kremlin to the Garden Ring that goes around the city center, is the perfect place for just wandering and enjoying a sunny day. 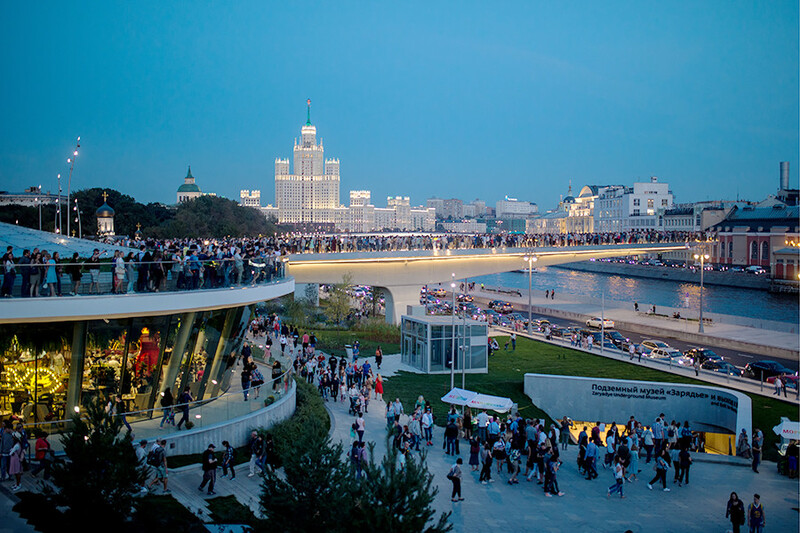 "Moscow's High Line", Zaryadye is new even for Muscovites, let alone visitors - but surely worth exploring. A very good point from which to begin your walk is the new Zaryadye Park a stone’s throw from the Kremlin. Its unique concept includes four different climatic zones (recreated artificially), a “floating bridge” over the Moskva River, and a philharmonic. It’s much worth a visit – just check out these pictures. The new and old coexist everywhere in Moscow. So, after visiting Zaryadye it’s natural to cross the street and find yourself in Red Square, which has St. Basil’s Cathedral, the State Historical Museum, Soviet and Imperial era statues, and Lenin’s Mausoleum. Each has its own peculiar story, so it’s a good idea to find the time, buy a ticket, book a tour and go. Old but gold. (Red, to be more precise). The same applies to the Kremlin, the centuries-old citadel of Russian rulers. You also have to buy tickets, but it’s absolutely worth it. Where else can you see the treasures of the Russian tsars, which are kept in the Kremlin Armory? Moscow’s fantastic museums aren’t confined to the Kremlin and Red Square. The State Tretyakov Gallery, the leading Russian repository of national fine art is also a must, as well as the State Pushkin Museum on Volkhonka Street. But remember – the collections in these museums are big so a visit can take a few hours. Aside from Zaryadye, Moscow has a lot to offer those enjoying a walk in the park. 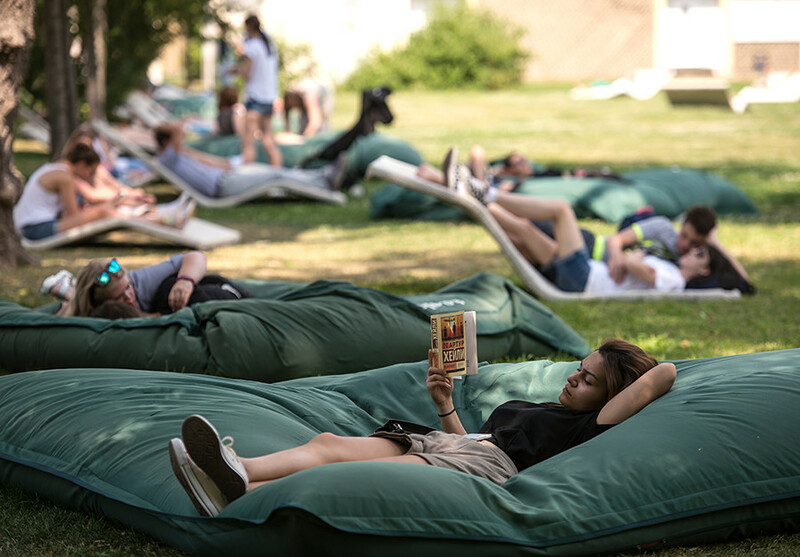 Several years ago, city authorities turned Gorky Park into a mecca for youngsters with facilities ranging from an open-air cinema and a museum of contemporary art, to sport centers and dance floors, not to mention zillions of cafes. The usually crowded Gorky Park leads to more serene places – Neskuchny Garden and Sparrow Hills – where one can roam quietly, listening to the whispers of Russia’s natural beauty. Another great place in the center, across the street from Gorky Park, is Muzeon Park with its huge collection of old Soviet monuments. 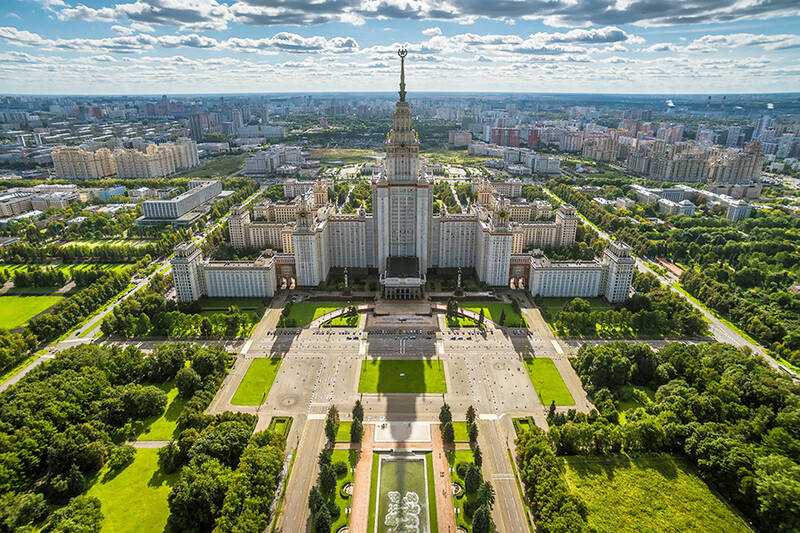 The Moscow State University (MSU), one of the "Seven Sisters" Soviet skyscrapers. Right neat the building Sparrow Hills park is situated. To have an even closer encounter with the past you can visit VDNKh in the northeast where there are many pavilions dedicated to the former Soviet republics, as well as scientific achievements. If the USSR is not your cup of tea, then go to Tsaritsyno, a marvelous royal estate found by Catherine the Great in the 18th century; or Kolomenskoye, a wooden residence of the tsars dating from the 16th – 17th centuries. Metro stations: Gorky Park, Muzeon, Neskuchny Garden – Park Kultury, Oktyabrskaya; Sparrow Hills – Vorobyovy Gory; VDNKh, Tsaritsyno and Kolomenskoye, respective stations by same names. The chance to behold this 12-million inhabitant city from a bird’s-eye view is surely an unforgettable experience, especially when the weather is excellent. There are several places in Moscow from where you can do this. First, Ostankino TV Tower – the well-seen, needle-like building in the northeast. Here is a detailed instruction on how to get there. Then, Moscow City has two skyscrapers with viewing platforms on the 58th and 87th floors, respectively. 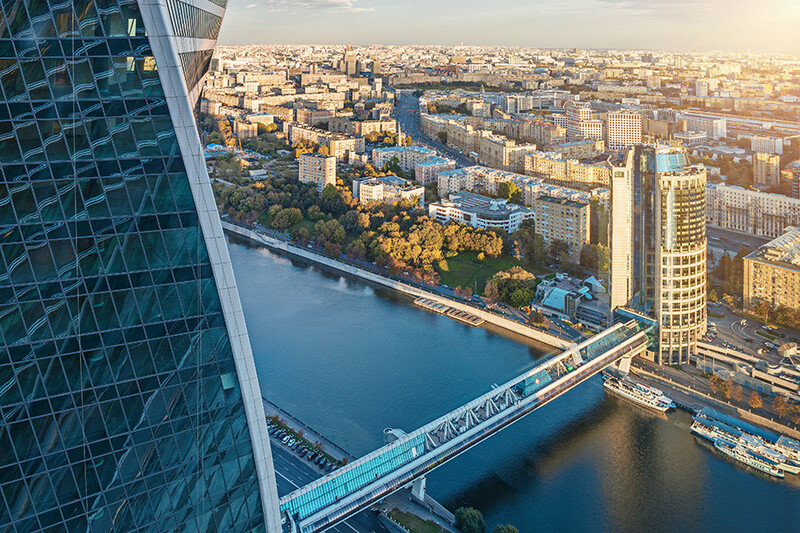 A view of Moscow from the Federation East Tower in the center of the Moscow City business district. Last but not least, the absolute classic is the lookout on Sparrow Hills, where the whole center of Moscow, three of the seven “Stalin’s Sisters” skyscrapers, Luzhniki and Moscow City, are set before you. Almost anyone visiting Moscow for the first time must come here. There’s one beautiful Moscow destination that can’t be seen from a viewing platform – the Moscow metro. More than a transportation system, its many stations, especially in the center, resemble palaces and are listed as part of the national cultural heritage. So, while hurrying from one place to another, try stopping and take in the beauty around you. Here’s a simple list of how to ride the metro like a local. We would need a book to describe all the fantastic places that you should see in Moscow. 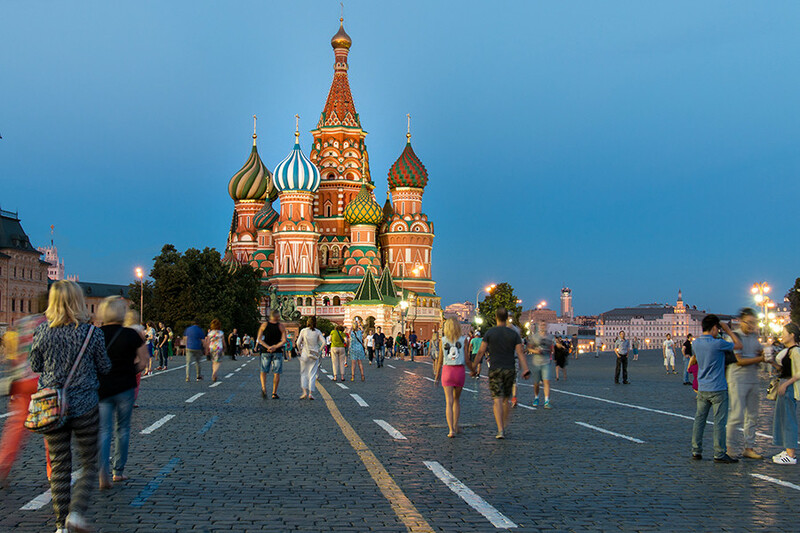 Russia’s largest city has it all: from graceful churches and avant-garde buildings that embody a wondrous architectural spirit, to countless restaurants and bars for tourists to rest after exploring all that beauty. Have a nice trip. While walking around Moscow you’re likely to communicate with Muscovites. To be prepared, read our article on what they’re like.